The move into flexible modules is a direct challenge to ECD, SoloPower and Ascent. 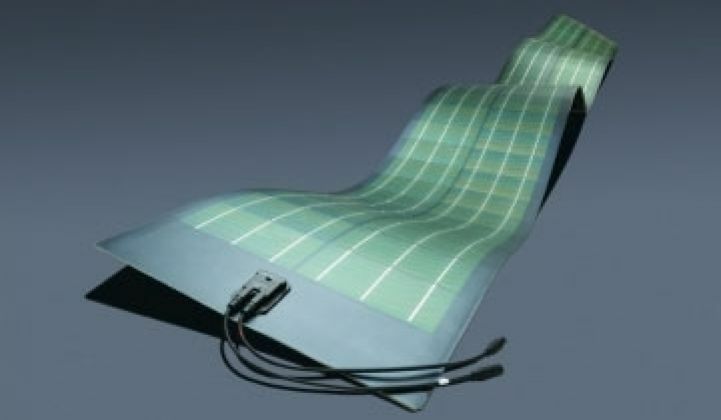 Global Solar has been shipping flexible CIGS solar cells for years for applications in portable solar charging, as well as selling PV cells in strings for other vendors to assemble into modules. Global Solar has also supplied CIGS cells to Dow's solar shingle endeavor. But today the company is announcing that it is in the module business -- the flexible module business. I spoke with Jeffrey S. Britt Ph.D., the company's CEO, and Jean-Noel Poirier, VP of Marketing & Business Development, about their newly announced product. Global Solar is targeting the commercial and industrial flat-roof market with applications that favor a lightweight, non-penetrating solar solution with a very large flexible panel -- 5.75 meters long by half a meter wide. The lighter weight makes installation easier and reduces the cost of balance-of-system components. The firm claims this is the highest efficiency module on the market. Their largest module, according to Poirier, is 300 watts and 12.6 percent efficient. The argument is that about 30 percent of flat industrial roofs would be structurally challenged by the weight of the glass and metal used in flat-panel c-Si and mounting equipment. It's similar to the case made by firms like UniSolar, SoloPower, Ascent, and now Global Solar. (UniSolar's product is lower efficiency and based on triple-junction amorphous silicon, not CIGS.) Another firm, HighFlex Solar, is working on flexible solar using crystalline silicon. According to Poirier, 30 percent of flat roofs can bear no more than than an extra ten kilograms per square meter. If that's accurate, it's still an enormous market. And like the other flexible panels, Global Solar's product eliminates wind load and penetrations. Because it is laid flat and not tilted, Poirier claims that more of the roof can be utilized and more power harvested from the same given area. He claims that in Northern latitudes like Munich, up to 96 percent more energy can be harvested versus tilted flat panels and 45 percent more energy in Rome-level latitudes due to avoidance of shading issues. The encapsulant material was once a sticking point for flexible panels, but the CEO assured me that, "We've scoured the earth for producers of vapor barriers for our product" and that the manufacturers have "gotten much more savvy about vapor barriers." Global Solar has also devoted efforts to "mitigate the susceptibility of the PV material to moisture" -- an always-looming threat to CIGS panels. Flexible panels like Global Solar's that are intended for flat warehouse roofs don't go through the typical solar installer channel. This is not the domain of solar installers, according to Poirier, but rather is the territory of roofing professionals. The channel to market is the roofing companies -- manufacturers of polymer, metal or bitumen roofing membranes. Considerations like high-power density, no penetration and no wind load are "on the top of the list for the roofing companies." Stating "we are a private company" that doesn't have to divulge such details, the CEO declined to specify the firm's dollar-per-watt cell and module pricing. It's fair to say that no company has really figured out the CIGS PV materials system yet. Yes, companies like Solar Frontier, Solyndra, Global Solar, Wueth and to a lesser extent, MiaSole, Nanosolar, SoloPower are shipping product. A few others firms like AQT are on the cusp of shipping. But none of these firms have yet proven that they can compete head-to-head on a cost basis with the leaders in photovoltaics, such as First Solar and some of the Chinese module companies like Suntech, Yingli and Trina Solar. ISET is coming out of its 20-year quiet phase and making some pilot line announcements for its ink-based and printing-style process. Stion unstealthed as a CIGS startup -- with a bit of a twist. They've made some waves with their funding and manufacturing arrangement with TSMC. SoloPower, equipped with a new CEO and with some boardroom nastiness behind it, is looking to close a government loan "in the low hundred millions" to help finance the factory build-out of its CIGS-based, flexible thin-film photovoltaic modules. MiaSolé looks to ship 13% efficient modules by the end of the year. The firm just announced a large-scale supply agreement with juwi for 600 MW over several years. Solyndra continues to win large rooftop installations such as Anheuser-Busch, Coca-Cola and Frito Lay. Inside sources say that the firm is sold out for years to come despite their troubles. Solar Frontier (the former Showa Shell Solar) sold approximately 43 megawatts of CIGS PV in 2009 and could ship more than 100 megawatts this year according to Shyam Mehta, one of our esteemed solar analysts at GTM. The firm will be investing heavily in capacity ramp up. The firm has big backing and big plans. AQT won $10M in funding and entered an agreement with Intevac. The firm also announced its first customer and the launch of its first 15 MW of production. Daystar got its fifth CEO in twelve months and announced some less than stellar financials. Johanna Solar supplied panels for a Bosch building façade. Johanna Solar Technology’s acquisition by the Bosch Group has been completed and the company is now Bosch Solar CISTech. Other CIGS manufacturers include PV Sunshine (Centrotherm turn-key), Jennfeng, Tokyo Ohka Kogyo (TOK) together with IBM, Ritek, nanowin, and Axuntek.